This project is my attempt to build a portable standalone VNA (Vector Network Analyzer). 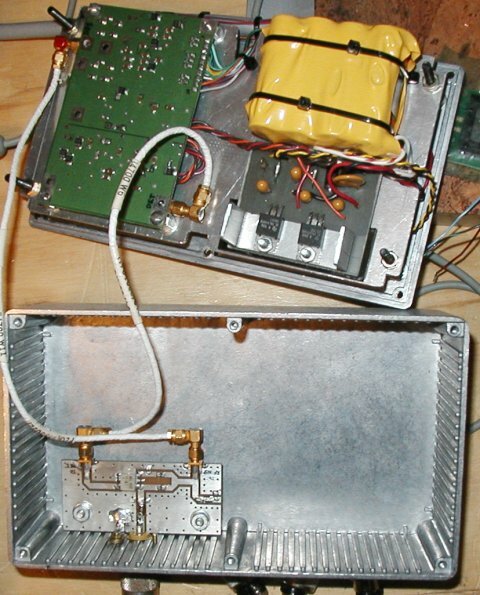 My main focus was to build an instrument that could be used at the antenna feed point to measure impedances. Once the antenna impedance is known, the smith chart can be used to suggest various matching networks. 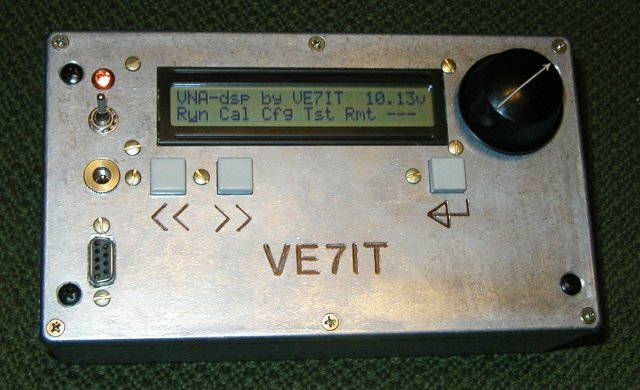 This instrument uses the VNA RF board by Paul N2PK . I received a great deal of information from Greg W8WWV regarding some of the complex math involved dealing with the analyzer computations and calibration. He kindly provided the sources for his gnat and exeter windows programs which I used to develop the vna-dsp software. 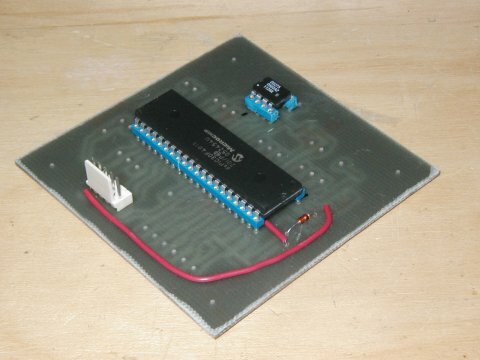 Greg also supplied blank PCB boards for the VNA and the reflection bridge. I sourced most of the parts through the Analog Devices sample program, Digikey, the National Semicondutor sample program, and the Microchip sample program. My thanks to the hams and companies that made this project possible. 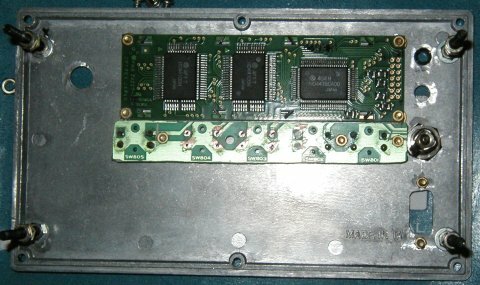 The N2PK board is meant to be used with a computer or laptop as the operator interface. 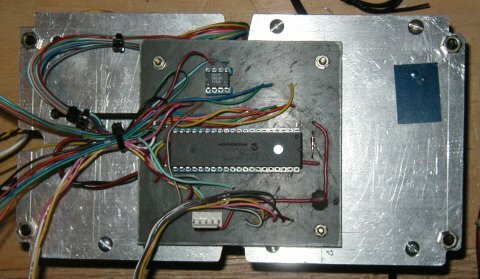 This project uses a very powerful micro controller (the dsPic30f4011) to tie together the 2x24 LCD display, 3 push buttons, a home made rotary encoder for frequency selection, a battery voltage monitor, a serial remote computer interface, a dual regulated 5V supply (one for the rf board and one for the digital processor board) and the VNA board. The whole box is powered by 8 AA Nimh cells. This project turned out to be a quite an undertaking. 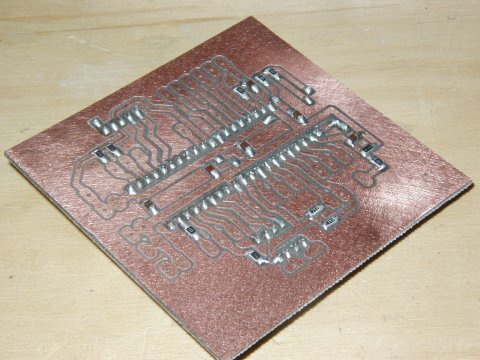 mechanically etch circuit boards on a milling machine. This screen is displayed after the initial version screen on power up and is where one gets back to when exiting one of the 6 selectable modes. To navigate through this screen, one uses the << and >> buttons to move the cursor to the desired mode. The cursor is shown as a flashing underline under the middle letter of each selectable option. To activate the new mode, one presses the enter push button (shown as a drooping arrow). The battery voltage is displayed in the upper right of the display. One should check this periodically and recharge the system when the voltage drops below about 8.8volts (1.1v/cell on an 8 cell pack). The 2300mah cells run the VNA for about 4-4.5 hours. Once the volatge drops below 9 volts, there are only minutes of operation time left. 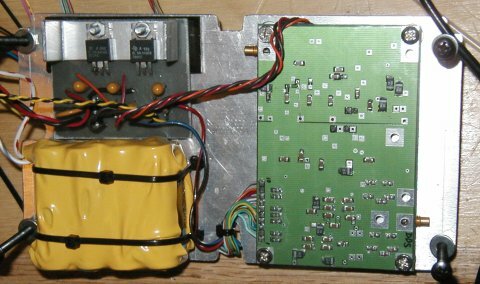 This voltage is regulated down to 5 volts by the internal power supply card. It is also used directly by some circuits on the N2PK VNA card. There are 6 different versions of run screen, each showing different measurement data. The first screen is my most commonly used screen. The first run screen displays the selectable frequency, the calculated SWR (referenced to 50 ohms) and the real and imaginary components of the measured impedance. Notice the underline cursor under the Mhz units digit on the frequency display. 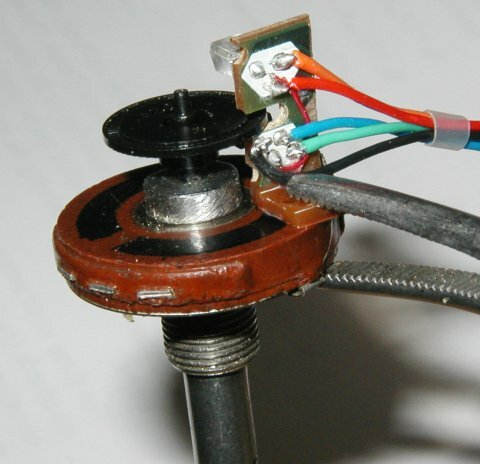 Turning the rotary encoder knob increments or decrements the selected frequency digit resulting in frequency steps of 1mhz, 100khz, 10khz, or 1khz. Use the << and >> keys to increase or decrease frequency step size. After each frequency change, the new SWR and impedance numbers are calculated and displayed. If you move the cursor down to the = sign, and rotate the encoder knob, to will be able to select the particular run mode data you wish to view. To leave this screen press the enter button. The second version of the run screen shown above displays the same top line of data as the first screen. The second line of the display changes to show the impedance in the polar co-ordinate system (value at some angle). The third version of the run screen displays the complex reflection coefficient. The fourth version of the run screen displays equivalent capacitance in pF of the imaginary part of the impedance if the impedance has a capacitive reactance component. The fifth version of the run screen displays equivalent inductance in nH of the imaginary part of the impedance if the impedance has an inductive reactance component. The sixth version of the run screen displays the calculated Q of the complex impedance. The seventh and final version of the run screen displays the calculated return loss in dB. Once you set the start and end frequencies for the calibration run, use the >> key to move the cursor to the Start item... press the enter key... you will be prompted to connect each of the 3 calibration standards, press enter as each standard is mounted on the RF test connector. You can abort out of the calibration process by moving the cursor to the Abort option and pressing the enter key. 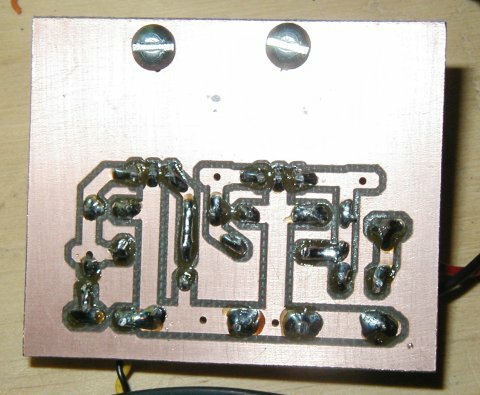 The N2PK VNA board has a frequency range of 0.050 to 60.000Mhz. To make the most accurate measurements, you should calibrate the analyzer over the range of expected use. Internally, this range is split into 30 calibration points. Calibration is done using the OSL model. OSL stands for (O)pen, (S)hort and 50 ohm (L)oad. The calibration data for a specific frequency uses linear interpolation between the calibration points. Once calibrated, the 30 internal calibration points are stored in EEPROM inside the dsPIC processor. If a valid calibration has not been done, the screen will display a "Please Calibrate Me" message. Run screen impedance measurements are limited to the range for which the system has been calibrated. One very powerful feature of this calibration process is that you can recalibrate the system to include a length of coax between the VNA and the calibration reference plane. There are only 3 configuration options in the current version of software. The first is for describing the actual frequency of the reference oscillator used on the VNA board to the VNA-dsp software. The easiest way to adjust this is put a frequency counter on the rf connector and rotate the encoder knob until the output frequency is 10.000000mhz. You should be able to set the 10mhz output within 1hz. 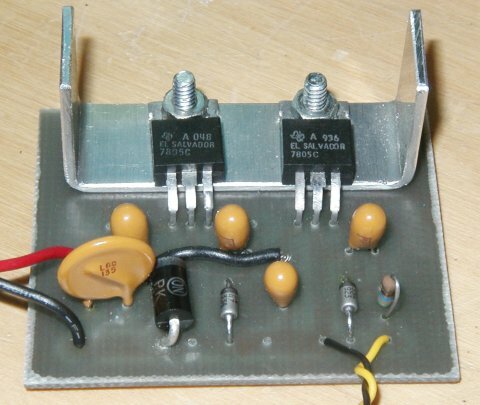 This approximately 150mhz reference oscillator is used to feed DDS chips on the VNA board. The second adjustment is the contrast adjustment for the LCD display. To alter this parameter, use the << and >> keys to put the cursor under the Contrast column and then turn the rotary encoder while watching for best display contrast. For my display, 0 seems to work the best. 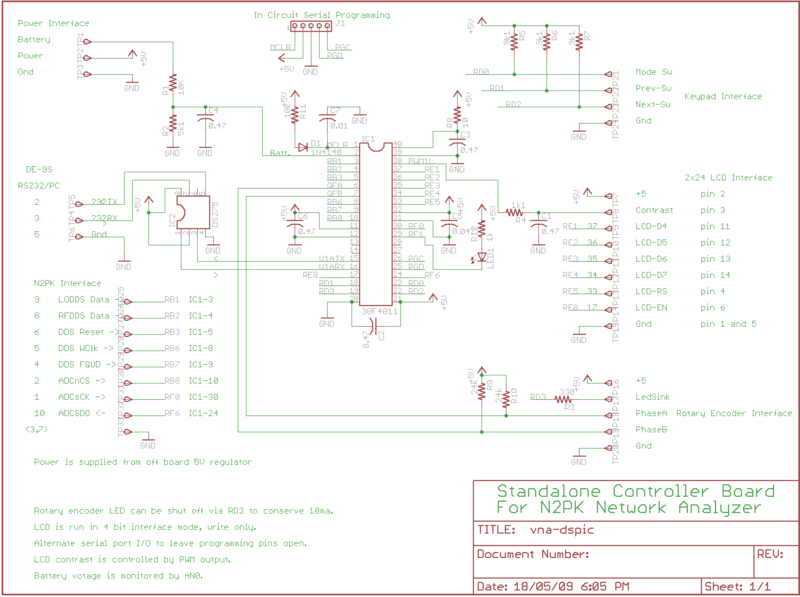 The final parameter is the sample rate for the A/D converter on the VNA card. Slow is the 7hz (most accurate) conversion speed and fast is the 880hz conversion rate. The test screen displays the raw zero degree and ninety degree voltages measured on the VNA card. These numbers should display voltages between -1.25 to +1.25 volts. The voltages will vary depending on the load connected to the RF connector and the frequency selected by the rotary encoder. The VNA-dsp is normally used without a computer but has the option of being used to collect impedance measurements automatically with a laptop. The interface runs in a 9600N81 configuration. To request a measurement, have the computer send the VNA-dsp a frequency in hz ( ie 10000000 would be 10mhz ) followed by a carriage return. The VNA-dsp will respond with 2 floating point numbers representing the measured impedance. You can test this operation by using any terminal program like minicom (linux) or something like procomm on windows boxes. The remote screen will show the frequency data as it is received from the PC and the counter in the upper right corner of the screen will increment as each character is received from the PC. The computed impedance that is sent to the PC is displayed on the lower line. There is also some extra data sent to the PC when the VNA-dsp is powered up announcing the internal software version as well as internal error messages if there are hardware problems detected by the software. I am currently working with the author of the linux program known as linsmith to add in support for automatic collection of data points for display on the smith chart. Also see linsmith on sourceforge. This data allows one to monitor the two bridge output voltages (V0,V90) over time with a slowly decreasing battery voltage. If there is a valid calibration, the final 4 numbers show the drift in the calculated reflection coefficient and the complex impedance. In my case, I am seeing impedance numbers change about 0.15% during a 4 hour period from a cold start. This could probably be reduced by allowing the unit to stabilize for 10 minutes before doing the initial calibration. During this output, every 5 measurement cycles the DDS chips are reset and re-initialized to make sure they can be consistantly synced. During normal use, this screen is not used. It may change over time as I explore various software options on controlling the hardware. To exit this mode, just press the enter key to return to the main menu screen. A lot of this project is mechanical packaging of various components. The Microchip MPLab integrated development environment with the C30 compiler was used running under VMware/WindowsXP on an Ubuntu linux computer. The MPLab project files and all the source code files are available later on this page. 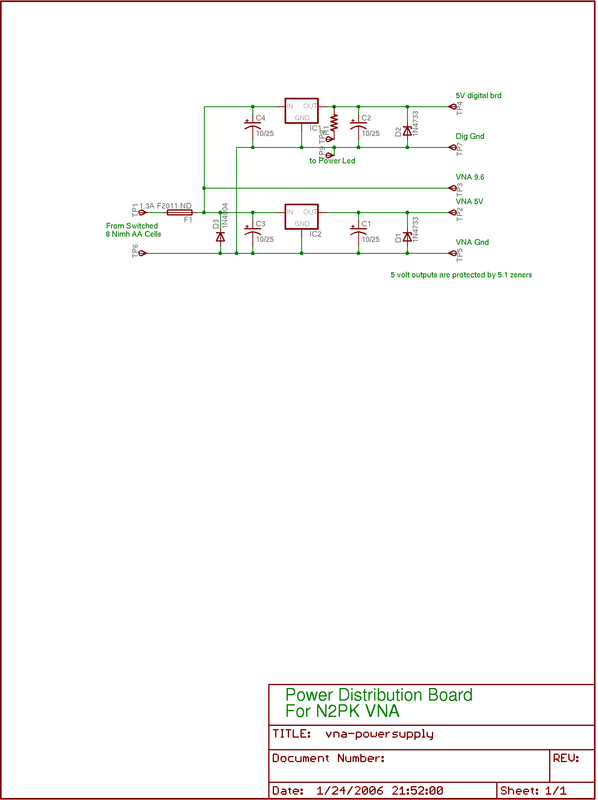 The eagle PCB files are supplied below for the power supply and the processor board. I do not have plans to market this project or any of its parts. I am releasing this design and software for anyone to use for non commercial use. I am available as a consultant for commercial applications of this or similar products. My contact information is available on my home page. a standbye mode where the DDS chips are powered down, encoder led powered down, and the status led is shut off.